This is a screenshot from the ‘it’ game of 2017, PlayerUnknown’s Battlegrounds… or PUBG for short. The previously PC-only game was released exclusively on the Xbox on Dec. 12, 2017. Within the first three days, the game has already seen upwards of a million players. Those numbers are truly astounding and signal a shift in the ‘shooter’ genre of video games. 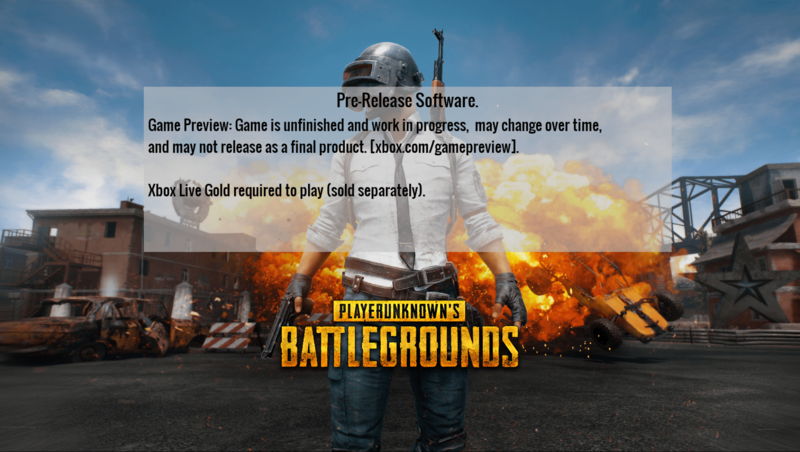 This is in addition to the 24 million players that have already experienced this game on PC. For the uninitiated, PUBG is a ‘battle royale’ style game. 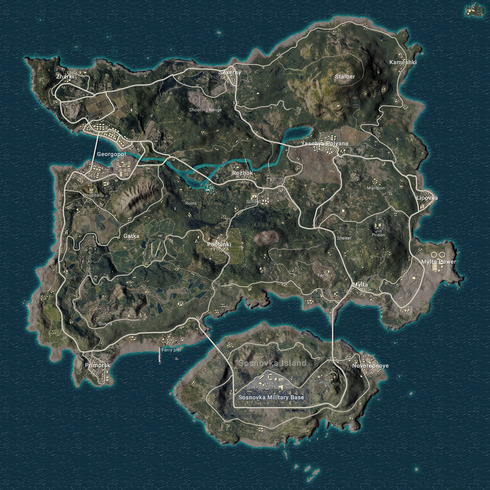 100 players are air dropped from a plane onto a VERY large island. Each player starts with nothing and has to scramble through the landscape and buildings to loot gear and weapons. It then becomes a ‘last man standing’ competition to survive with the goal of attaining the ‘winner winner chicken dinner’ 1st place ranking. A clever, ever-shrinking ‘storm’ mechanic forces players to move into increasingly smaller ‘safe’ areas, resulting in guaranteed combat. This is a relatively new concept in a genre that desperately needed one. Call of Duty, arguably the king of the hill of shooters, has long ago taken its ‘running in circles’ meat-grinder approach to gaming and milked it dry. Years of going off the rail into the future has decimated its player base. Even 2017’s return to classic boots-on-the-ground in a WW2 setting has only re-affirmed that most fans of the genre have been there and done that, and have been doing that for too many years. Which is one factor that has led to the success of Battlegrounds. It’s something fresh and injects a much needed dose of strategy while also (somewhat) leveling the play-field. 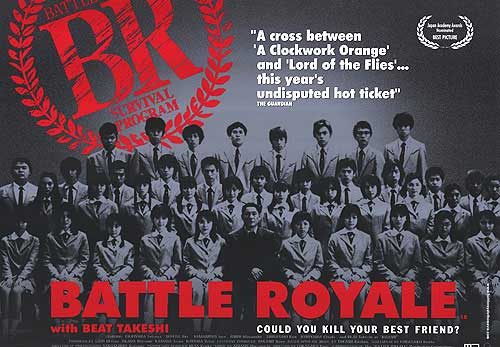 There are two core elements that started this phenomena… the 2000 film ‘Battle Royale’ (a Japanese movie about a group of school-age children forced into a life-or-death, kill or be killed scenario – think a more violent “Hunger Games”), and the Arma 2 game, or more specificially, the DayZ mod of that detail orientated military shooter. Lead designer Brendan Greene, also known by his gamer handle, PlayerUnknown, had taken an interest in programming, with his focus on the survival aspects of DayZ. He saw the repetitive nature of the small maps and the kill/respawn tedium that most shooters embraced. Instead, he opted for larger maps with randomized equipment, giving the player a unique scenario with each game. As the stand-alone mode of DayZ became more popular, interest in his DayZ: Battle Royale mod tapered off and Brendan moved unto the Arma 3 game and further refined his vision. Sony Online Entertainment caught wind of Greene’s work and brought him on as a consultant for development of their H1Z1 project which was divided into two concepts: a survival game (like DayZ) and King of the Hill (predecessor to Battlegrounds). Many of the concepts presented in the King of the Hill version would find their way polished into the Battlegrounds game. 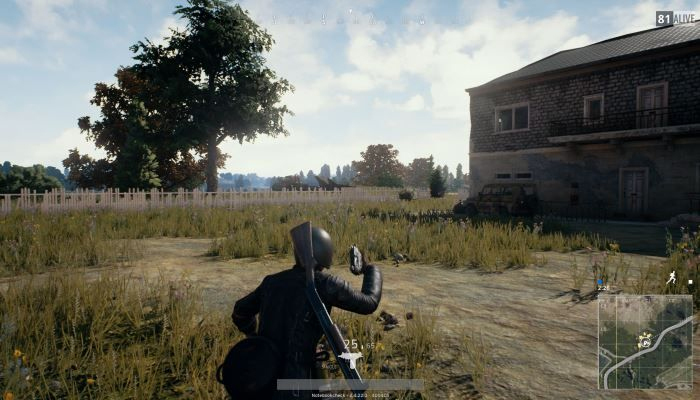 A Korean studio called Bluehole recruited Greene to work on bringing the Battle Royale concept into a full release utilizing the popular Unreal game engine. In March of 2017, early access to the game was provided on PC through the widely used Steam platform and was immediately a break-out success. The game saw player count spike into the millions, numbers that would make any video game company envious, (including the all-mighty Call of Duty). To say this game is ‘successful’ is a severe understatement. It is literally revolutionizing the whole genre. Numerous other companies are scrambling to cash in on this craze by rushing their versions of the concept to market. Free to play Fortnite has been the most visible, despite its relatively cartoon-ish graphics and simplified game-play. Dying Light (a popular zombie themed First Person Shooter-like game) has announced a soon to be released battle royale style mod. And Call of Duty is currently testing its own version on China based servers. For the foreseeable future, the ‘Battle Royale’ last-man-standing style of gameplay will be a dominant force in the shooter genre. So why is this game attracting so many players? Aside from the (much needed) ‘it’s something different’ observations, there are some aspects that are inherently attractive. The map is HUGE. Most shooters take place on very small maps, which are easy to memorize and allow repetitive game-play to set in very quickly. Call of Duty and the like has suffered from this for years. Different graphics, same game-play. Battlegrounds has such a wide variety in the terrain and buildings, it takes many hours of gaming before one starts to feel like they ‘know’ the environment. Vehicles are scattered around the map, which help traverse the sometimes long distances needed to stay within the constantly shrinking and evolving ‘safe zones’. This mechanic of the always present, imminently threatening storm is the key to utilizing such large maps. No matter how scattered the players, they will eventually be forced together into deadly confrontations. This makes the players battle not only each other, but the landscape as well. In addition to a killer storm, random ‘red areas’ appear where a barrage of artillery will rain down for short periods of time, even in the ‘safe’ zones. This adds one more danger to the mix that forces players to move and find shelter. The idea that all players are dropped in with no weapons is a clever way to create a fair start to each round. In so many shooter games, players advance in levels as they gain experience, which typically opens up more options for better guns and equipment, putting lower level players at a severe dis-advantage. In Battlegrounds, everyone starts the same (with nothing) and have to loot locations to find adequate gear to ensure their survival. This idea throws a bit of luck into the equation and ensures each round plays out differently than the last. Some rounds can last upwards of 20-30 minutes or more, while some will find themselves taken out very early. This creates a wider variety in gameplay and only adds to the games appeal. With this randomizing of loot and drop-in location comes a need for more strategy than the traditional, ‘kill everything that moves’ mentality. While possessing some degree of skill will allow the better players to progress further, the fact there is no respawn and death is permanent gives weight and purpose to how one plays through each round. The aim is to survive as long as you can, with the ultimate goal of being the last one alive. This creates moments where it is actually better NOT to engage in a fight which leads to staying in the game longer. Very few shooters can incorporate the idea of ‘not fighting’ and make it work when gamers have been programmed for years with the idea that ‘if it moves, shoot at it’. Often, the best strategy is to avoid conflict and let other players take each other out, ensuring a high position for the clever, more cautious player. This does, however, create certain ‘down times’ within each round where a player might go several minutes without seeing any action. While this might be an adjustment to the frenzied tempo that most shooters aim for, there is an ever-present tension in the knowledge that another player could be hiding… anywhere. When the action does break out, the round ending perma-death creates a new level of importance and purpose to each confrontation. There is a ‘number alive’ counter that clicks down with each player death. As that counter drops into the lower numbers, the excitement grows. Anyone who has made it into the ‘top 10’ of a round can attest to the increased intensity felt. When someone makes it to the number 1 position, they are rewarded with the coveted ‘winner winner chicken dinner’ and appropriate stats are recorded for posterity. What this means is that the current version of this game is very rough around the edges. All of the following issues exist, but most likely will be polished away with future updates. The first 30 seconds (or more) of each round shows a severe lag in the loading of graphics. This in-game load time finds the player on the ground, looking at ‘blurry’ buildings, as they wait for all the graphics to load. This can be so slow at times, one cannot even find the door to enter a building because it has not been rendered yet. Frustrating frame rate drops and stutters plague these round openings, almost to the point of making the game unplayable. The problem seems to smooth itself out as the world finds a more stable build, but it makes for a nearly unplayable first 20-30 seconds. This is a bummer as that time is a manic scramble to find at least one gun in case of early confrontations. And while the rest of the round runs much smoother than the opening seconds, random moments of lag-stutter are possible at any point in the game. The overall frame-rate is about as low as it can get and still be considered ‘playable’. This will make the shooting seem stiff compared to other gun games. It can also effect game-play in undesirable ways… like the time I was driving across a bridge that failed to load completely, resulting in my car just passing through the bridge and ending up in the water. Thankfully, your character can swim. Unfortunately, in that particular instance, I couldn’t swim fast enough and was caught in the storm and died… because of a graphic loading error. There are places your character can get stuck (mostly behind cluttered items in buildings), which will also most likely result in a ‘death by storm’ as you haplessly try every conceivable motion to un-stick your character. There is also a need for the ability to ghost players after your death. Once you are taken out, that’s it, you cannot see how the rest of the round finishes out. Nor can you see how close you got to killing the opponent that eliminated you, which is a bit frustrating. 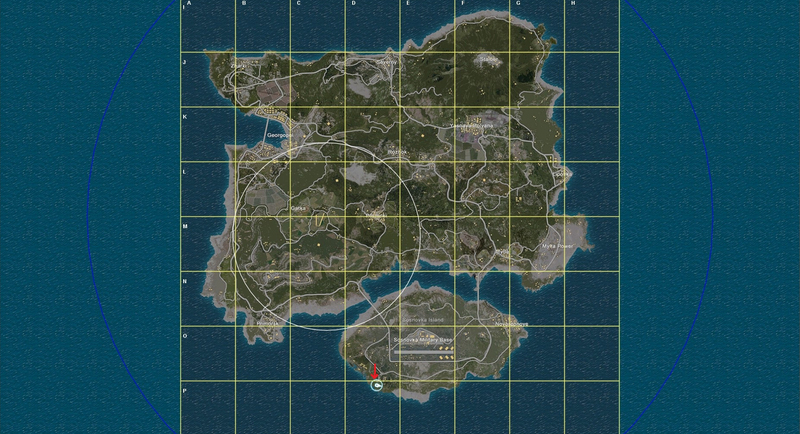 With such a large map, locating oneself to see where the circle is and the players relation to it is difficult. The icon that shows you on the map, is inconsiderately colored with the same white as the buildings, city letters and overall tone of the map. It would make much more sense to make that a bright color so it was easily seen. Finding items and then picking up the ones you want can be a chore. Often, gear is layered into piles, making it difficult to highlight the item you want to acquire. Many times, the player will be unintentionally picking up items and replacing guns with unwanted ones, forcing them to work through an already clumsy inventory management. 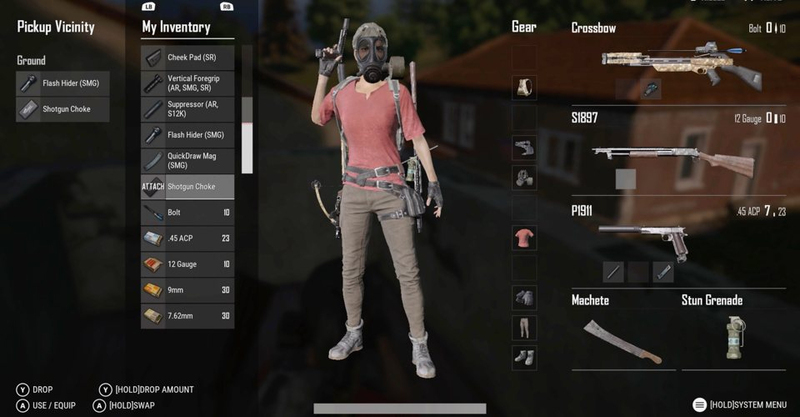 The game has a fairly wide variety of gear (guns, grenades, health fixes, attachment for weapons, helmets, armor, and other purely aesthetic clothing). Working through the inventory screen can be tedious and time consuming. This becomes especially problematic when trying to ‘loot’ a fallen player’s gear. As one gets more familiar with the complex controls, the time needed to accomplish looting will drop, but most all players will fall victim to getting shot at some point while managing their inventory screen. The Grand Theft Auto series has the best inventory management mechanic (a radial dial that just requires a thumbstick directional push to select gear) and Battlegrounds would improve a lot in this area if they would borrow from this idea. Another (small) complaint is leveled at whoever decided ‘reload’ would be accomplished by holding down the ‘x’ button (as opposed to just tapping the ‘x’ button like in EVERY other shooter on the planet). There are a lot of control mechanics the game needed to employ as it jumped from the easy to program PC to the hard to map out and stuck with what they give you Xbox controller. Numerous buttons have multiple functions based on whether you tap or hold them down. Even aiming comes in three different modes: firing from the hip, holding down the left trigger for a slightly zoomed in accuracy, and the left trigger ‘tap’ which will drop you into a ‘first person’ view down your weapon’s sights. It is a higher than average learning curve, but nothing most should have trouble with after playing through a few rounds. Despite the obvious ‘still in development’ state of the current build, the game is fun. The tempo might take some getting used to from veterans who have been playing various other shooters for years, but they should be able to find new ideas with PUBG. It is the closest to ‘hunting humans’ a video game has come and that creates the need for a new approach to traditional shooter game-play. The $30 price point seems reasonable and I have faith most of the issues players are currently facing will be fixed in the not so distant future. A new desert themed map has been announced for the PC version which will keep the play-field fresh and interesting if they bring those kinds of new content to the Xbox as well. The games popularity will ensure a large player base for the foreseeable future as the game has seemingly tapped into a vein that publishers didn’t even known existed until recently. The sheer number of clones coming down the pipe shows developers are paying attention to this break-out genre and you will most definitely see the ‘battle royale’ mode of game-play develop into its own sub-genre of shooter based gun games. For now… drop in, load up… and survive. 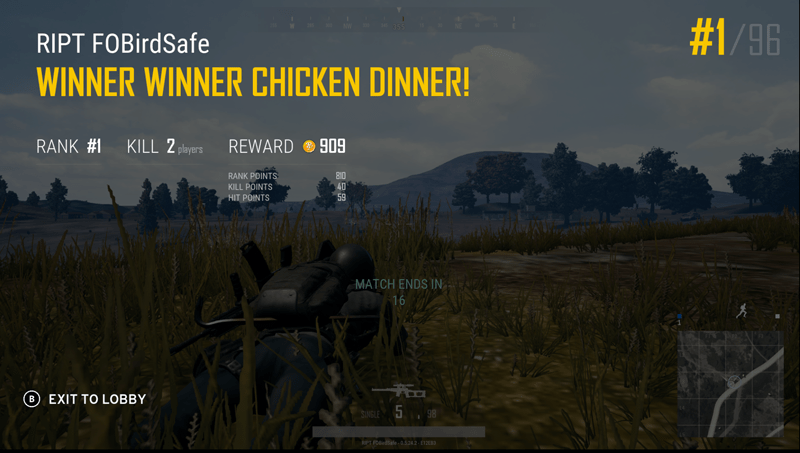 With a little luck and a dose of skill, you can walk away with your own chicken dinner just like me….